Do Not Give Your Best! – 1Beginner! Today, I am going to discuss about an idea that might change your life & you would get a much needed insight to reach your goals. Read till last to explore the possibility. Its been years, I have read hundreds of books, thousands of audiotapes & many more search. In the life of of super achiever, I have found The Only/Golden rule that everyone had been following some way or the other. For few its the philosophy of their life, for few its in their blood, for few its the way they are! But the Philosophy was common in life of these successful people. We all Wish to be successful , live an extraordinary life. We all wish to take leap of faith, jump over the cloud & accomplish something that no one ever imagined. We have almost everything to achieve in our life. but instead of looking at what we have we cry over the thing which we do not have & spend the rest of lives either blaming our luck, fortune or people, circumstances around you. I wouldn’t say that’s an excuse, your reasons, situations are perfectly alright from your point of view , still at the end they sound like excuses. Whereas, if we flip back the pages of the history, we would see that people who lived with stark poverty, Extremely unfavorable situations, with difficult & catastrophic circumstances than us have not only survived but made a leap in the sky like Phoenix! There must be something in them that made the difference! Isn’t it! You must have got this question in your mind. Its the profound ideology of this Blog. If you want to be extraordinary & reach that level of excellence, in any endeavor of your life no matter what you are pursuing, its all possible , all you want to absorb this profound idea. I would like to share the Golden Rule with you. Its as below. If you have seen someone going under a regimen or competition you must have heard people saying.I would do my best! I am going to give my 100% today. I don’t want to claim or comment about the outcome or result. but these are all uncertain statements & declare the vagueness about your efforts towards the achievement of your Goal. I would give my 100% ! I would give my 100% lets see what happens! I am trying my best today! I don’t know but I will try my best! You must have heard such statements. These are all optimistic statements. They show the positiveness & goodness in you but not the strength in your Attitude. Of course they are much better having pessimistic attitude. These statements are good but not the Best. Because I feel they are they are not only uncertain but undercharged as well. Do these statements charge you?Because the statements or philosophy that does not charge you, does not change you! Legends never do their best they do whatever it takes. Because when you do whatever it takes you simply becomes unstoppable. No one can stop you but you! No one can come in between you & your Goal if you are driving with The unstoppable vehicle of Whatever It Takes! May be you are doing your best now & still you are not seeing the results you wish to accomplish. Still you feel stuck, living in fear, paralyzed by the risks & not going beyond certain, I suggest you to stop living by the norms, people’s approval or the usual/formal way & within boundaries. I strongly recommend you to stop giving your best! Its the time to reform & review your Best! May be your best is the new average but you are not seeing it! May be its not The best that is required but something entirely different that you have to discover! 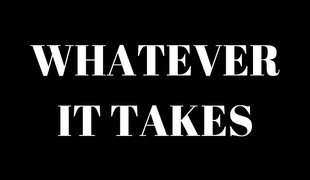 Pingback: Whatever It Takes! – 1Beginner!